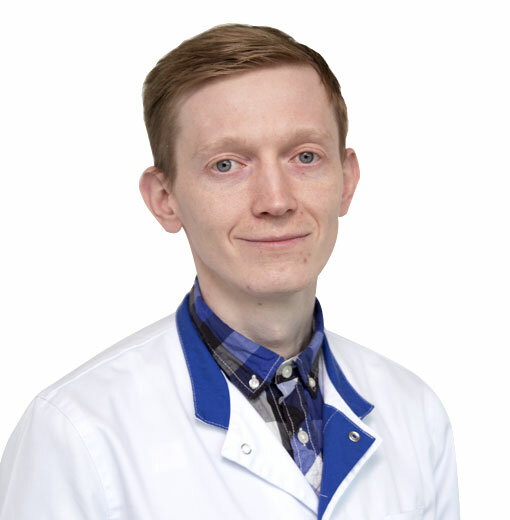 ELISEEV Yuriy, Doctor EMC. Make an appointment, ask a question. He graduated from the Moscow State University of Medicine and Dentistry. He completed his clinical residency and post-graduate training at the Moscow Regional Research Clinical Institute named after M. F. Vladimirsky. Hi is certified under the program of professional development of “Diagnosis, treatment and rehabilitation of patients with CVA”. He specializes in diagnosis and treatment of neurological patients, patients with epilepsy; provides advice for therapeutic, surgical and intensive care patients, performs cerebrospinal fluid examination in patients with suspected demyelinating or inflammatory disease. He was working in the Moscow Regional Research Clinical Institute named after M.F Vladimirsky from 2014 to 2019. He has 30 scientific publications and monograph.